I kinda hated my old account I guess?? NinjaTurtleGirl has started a donation pool! please donate some points to me. Sorry to bother you, but my entries to your group just expired. can you please sort something out? Yo i dont know if you remember me but i would to see what you did with that candy corn adopt thing a couple years ago? HAPPY belated BIRTHDAY, but 3 TIMES, NinjaTurtleGirl, dear hobbyist traditional animation artist 'n literaturist friend! Remember the two anime (Haruhi-chan 'n Mikuru) muro drawings I just made for you last year to 2 years ago, dear hobbyist, artist, 'n literaturist friend? Good luck from yesterday, but three times, and I hope you had a great b-day! And once again, keep up the good work on all awesome hobbies, traditional animation art, drawings, 'n literature writings; I love 'em! HAPPY BIRTHDAY once again, NinjaTurtleGirl, dear hobbyist 'n artist friend! Good luck once again, and I hope you'll have a great b-day today! 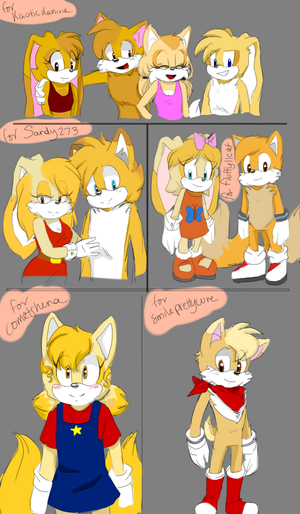 And once again, keep up the good work on all awesome art and drawings; I love 'em! 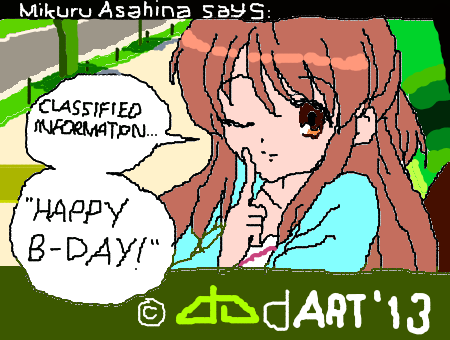 You're not gonna believe this birthday muro drawing copy I made of Mikuru Asahina wishing you one, so, wishes 'n' luck! Hi! Do you take requests?